The rider has to regularly groom the horse's coat to make sure it looks healthy and wonderfully glossy. First, she rubs the coat in a circular motion with the curry comb, and then she smooths it down with the horse brush. The horse's skin and muscles are given a nice massage at the same time. The hoof pick is used to remove earth, dung and gravel from the hoofs. It's essential the hooves are kept in great condition: after a ride through mud or a sandy arena, they are cleaned all over with the hoof brush. Finally, the grooming implements are washed and stored in the handy grooming kit. 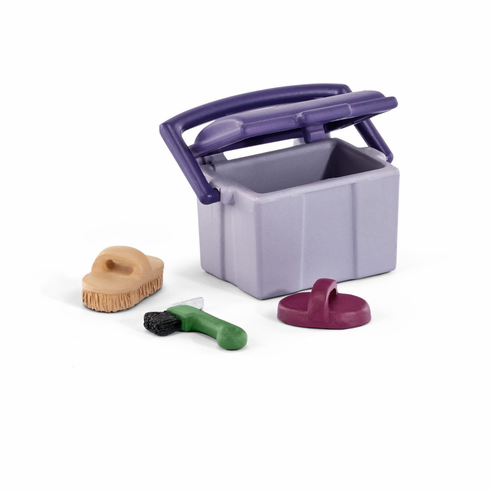 Contains: 1 x grooming box, 1 x hoof pick, 1 x magenta harness, 1 x beige massage brush.